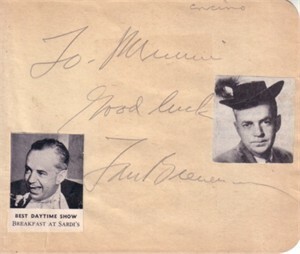 Roughly 4 1/2 by 5 inch autograph album or book page autographed in pencil by Tom Breneman, the popular host of the 1940s radio show Breakfast in Hollywood (died 1948 of a sudden heart attack). Inscribed To Mamie Good luck Obtained from the family of a Hollywood housekeeper who cleaned the houses of the rich and famous during the 1940s. Has typical yellowing for its age. With certificate of authenticity from AutographsForSale.com. ONLY ONE AVAILABLE FOR SALE.